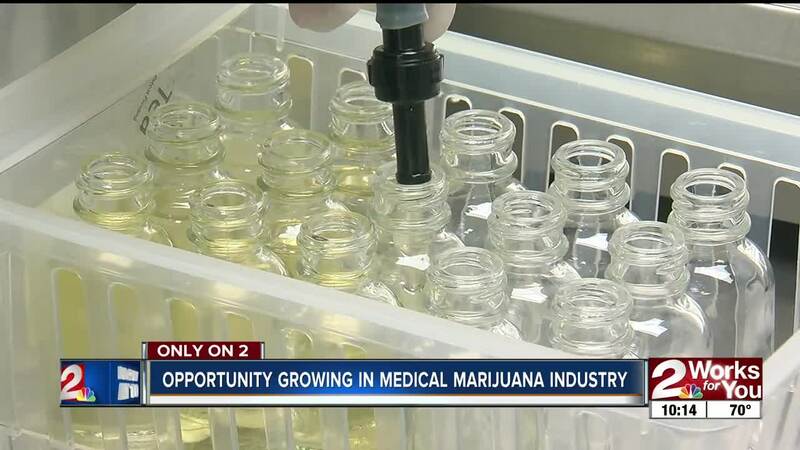 Opportunity is growing in Oklahoma's medical marijuana industry as fast as brand-new seedlings. With $5.7 million in licensing fees already collected from patients, caregivers, dispensaries, growers and processors, the state is ready to regulate the new industry. 2 Works for You met a husband-and-wife team determined to make it big in the field of cannabis. Cynthia and Chip Paul co-founded Gnu Pharma and have already launched other companies to meet the needs they anticipate in the medical marijuana industry. They set up operations in a small industrial Park in Owasso. "We've actually only been here a month," entrepreneur Cynthia Paul said. "We're still pretty new in this facility." Their companies do research, licensing, manufacturing and distribution, provide products they will "private label" for others to sell such as CBD shops, chiropractor clinics and doctors' offices. They also are processing herbal and CBD products such as a new cranberry seed oil with CBD. A fourth firm under development, Gnu Analytics, will test and develop products for growers and other processors. "To find out the efficacy, the THC, CBD content," Cynthia said. "Which is going to be very important with our testing and label requirements with regulations." With 16 employees already on the payroll, the Pauls are finding the business of weed is growing like its nickname. "Arguably, we will develop somewhere between a $40 million and $100 million industry almost overnight," Chip Paul said. The former statistical analyst turned entrepreneur sees more jobs opening up as the industry expands. While entry-level clerks will earn minimum wage, Paul says chemists and executives will be positions that pay very well. For now, they are simply waiting for the rapidly growing young cannabis plants to mature and grow the buds that will fuel sales. "Right now in OK it's not legal to put THC in products yet because no plants have come to maturity," Paul added. He expects that green light by the end of November or early December as growers harvest their first crop. In the meantime, the Pauls say they will keep growing their businesses one employee at a time. They recently hired Liz Dobson, a former mammography technician, who spent 18 years in the medical field. After starting work in their laboratory, Dobson is now their quality control director. She believes in the product. "Cannabis is an amazing plant and has a lot of healing properties," Dobson said. Starting a new business is not new to the Pauls. They say they were the first to launch a nationwide vape franchise in 2014. With medical marijuana, and all of the products that will be sold shortly, they believe they can win over even those who voted no on State Question 788. "If we can roll out this industry in a very responsible, respectful way," Cynthia said, "I think we can change a lot of minds." According to the Oklahoma Medical Marijuana Authority, the state has received thousands of applications. Applications – 11,402 patient, 98 caregiver, 675 dispensary, 1,043 grower, 277 processor applications (total of 13,495). Approved applications – 8.459 patient, 65 caregiver, 608 dispensary, 956 grower, 253 processor licenses approved (total of 10,336).